We recently received an email from one of our readers, introducing his YouTube channel – Japan Treasure hunters. Now I for one have not seen many You tubers covering Japan, and having a basic knowledge of its history, I was quite excited to watch the videos. I was certainly not let down. Some fantastic historic locations and fins are discovered, and I have subscribed to the channel hungry for more. I have a Youtube Channel called Japan Treasure Hunters. There are very few channels in Japan and I believe I am one of the few foreigners that participate here. I have detected on Iwo Jima, in my earliest videos, so production and editing is not that great. I have also visited some Japanese castle ruins and of course the beaches. I have only been doing my channel for a little over a year. During that time, I have found a coin from the 1350s and several ranging from 1600 to the late 1800s. Just recently I found a Japanese house seal for the Suwa Clan. The samurai would carry this “kamon” for good luck in battle. I have dated it to roughly 1590 because Japan stopped using copper and bronze for those type of things in 1668 and the castle I found it at was abandoned in 1590. 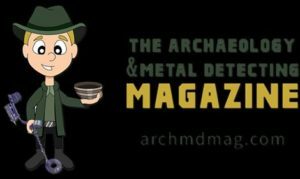 My thoughts on the metal detecting and treasure hunting hobby is not about the monetary value, but the idea of who held it, the lifestyle of the time and just getting out and enjoying nature. My intent of this email is to help broaden the view of metal detecting in Japan. I always see detecting channels for the UK but only a couple for Japan.